Sunglasses add comfort and help keep your eyes protected from harmful UV rays in all your outdoor activities. Martin Street Optometry has been committed to protecting eye health for more than 40 years. Dr. Klaming and Dr. Laverty believe that everyone needs a pair of sunglasses to help protect themselves from harmful UV rays. 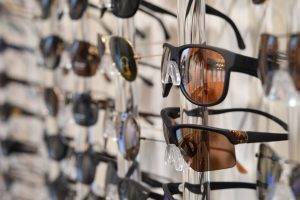 Our Optical Boutique offers a large selection of sunglasses for both prescription and non-prescription, including Oakley, Maui Jim, Serengeti, Ray-Ban, Adidas, Hugo Boss, Carrera, Kate Spade, Burberry, Coach, Guess, Dolce & Gabbana and many more! Fashion sunglasses with nonprescription lenses are called “plano” sunglasses in the eyewear industry. This category of sunglasses is huge and offers many choices in styling, designer names and frame materials, but most importantly helps to protect your eyes from harmful UV rays. Browse some of the designer eyewear brands we carry! Non-prescription sunglasses are particularly important for contact lens wearers. Anyone who wears contacts needs plano sunglasses to protect their eyes from the sun’s harmful UV rays. Sunglasses help keep contacts from drying out when outdoors, and shield the eyes from windblown debris. And, of course, sunglasses look great! Children may not be as interested as adults are in wearing sunglasses as a fashion accessory. In fact, some experts say we get up to 80% of our lifetime exposure to solar ultraviolet (UV) radiation by the time we’re 18 years old. We are a proud retailer of Real Kids Sunglasses, which offer 100% UV protection. But because kids spend so much time outdoors in direct sunlight, they need sun protection even more than adults. The boom in outdoor sports activities like mountain biking, snowboarding, rock climbing, kayaking, skiing, golfing and in-line skating has also created a demand for sports- and performance-oriented sunglasses. These special-purpose sunglasses are designed to be exceptionally light and comfortable, able to withstand extreme conditions and stay comfortably in place during any activity. At Martin Street Optometry, we specialize in sports related sun-protection which is why we are proud to be an authorized retailer of Oakley, Maui Jim, and Adidas sports sunglasses.